People who are physically challenged need bathroom facilities that allow them to shower safely. The average home bathroom does not have the proper equipment. You can modify your bathroom to make it wheelchair accessible, if the need arises. Combine a prepackaged accessible shower insert with the recommended safety modifications to create a safe environment for bathing in your home. Remove the existing bathtub and the drain. Turn off the water supply for the tub. Then unscrew the faucet handles, the stems and the tub spout. Disconnect the drain cover and the overflow. Take off one row of tiles above the tub to expose the clips that fasten the tub to the wall. Disconnect the fasteners. Then use a crowbar to pry the tub away from the walls. Slide the tub out and close the drain opening. You may need assistance with a cast iron bathtub. Measure the available area for your shower. The Americans with Disabilities Act requires that wheelchair accessible showers be at least 36 inches x 36 inches. The standard bathtub is usually 5 feet long and 30 to 34 inches wide. If your bathtub was only 30 inches, extend the width of your shower floor to meet the ADA minimums. Purchase a custom-built shower insert. Depending on the design of your insert, you can often use the existing bathtub faucets. Extend the old bath drain to reach the drain opening in the shower insert with a slip joint extension and standard or Dresser pipe couplings. You will need to cut the extension to the required length and slide your coupling onto both pipes to join the extension and the existing pipe. Depending on the size of your drain, you may also need reducing adapters. Attach a rubber shower pan to the top of the drain. Position your shower insert in the space. Align the drain with the shower pan and the faucets with the holes in the insert. Attach the shower insert to the bathroom wall, according to the manufacturer's directions. Drill holes through the shower insert into the wall studs for grab bars and rails. Attach them inside the shower, according to your design. Replace the existing showerhead with a handheld shower spray. It must be at least 5 feet long and usable in both fixed and handheld positions. Install a shower seat that is at least the width of the stall when your shower area is 36 inches x 36 inches. Position it 17 to 19 inches above the floor. It should be opposite the water faucets to comply with ADA design specifications. 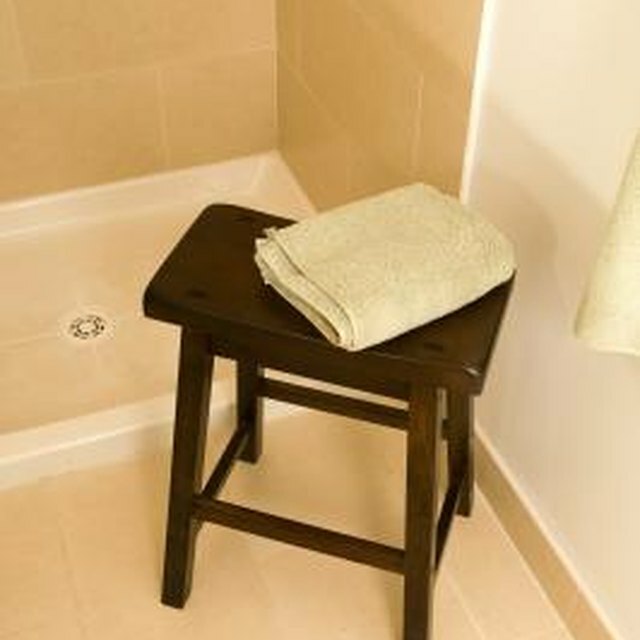 If the shower area is larger than the minimum 36 inches by 36 inches, you must install a folding seat on the wall adjacent to the water faucets. The ADA.gov website provides illustrations that will help you design your wheelchair accessible shower in accordance with government regulations. Finish the shower entryway with non-slip tile and a curb, if allowable. Any curb in an accessible shower cannot be higher than 1/2-inch tall. You cannot install a curb at the entrance of shower stalls that are larger than 3 feet by 3 feet. You may need to widen the entry door to comply with ADA recommendations. Provide at least 5 feet x 5 feet of space inside the bathroom to give a wheelchair an adequate turning radius. You should avoid making the shower stall too large. Stretching to reach items inside of the shower could result in injuries. Installing a curb helps to keep water off the floor but may require the use of a transfer bench once installed.